The memory guys are banking on today's launch of the Intel Skylake platform to be a catalyst for increased exposure and sales. If you don't know, the Core i7-6700K and Core i5-6600K processors can make use of DDR4 memory in dual-channel mode. Coinciding with the Intel release is a raft of Z170 motherboards that support said DDR4 RAM. 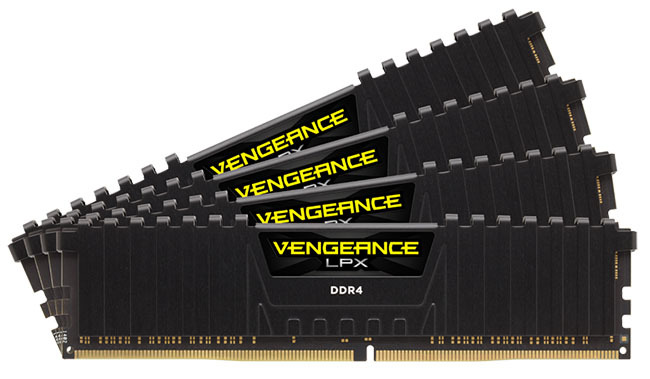 As you might expect, Corsair has been quick off the mark in providing Skylake-specific DDR4 kits in a wide range of speeds and capacities. Most kits are repurposed from the present X99 chipset lineup that also uses DDR4 and XMP 2.0 settings. Knowing that Skylake processors use dual-channel memory should pave the way for 16GB kits comprised of two 8GB sticks, just as you see with DDR3, but such capacities aren't widely available just yet once speeds exceed 3,000MHz. In a roundabout way, this is why Corsair has sent us a 16GB (4x4GB) DDR4 3,200MHz C16 kit for review alongside the Core i7-6700K processor. The kit is predominantly designed for the quad-channel X99 platform but also works just fine on Skylake, though do know that a 2x8GB offering, better suited to the new processor, is listed. 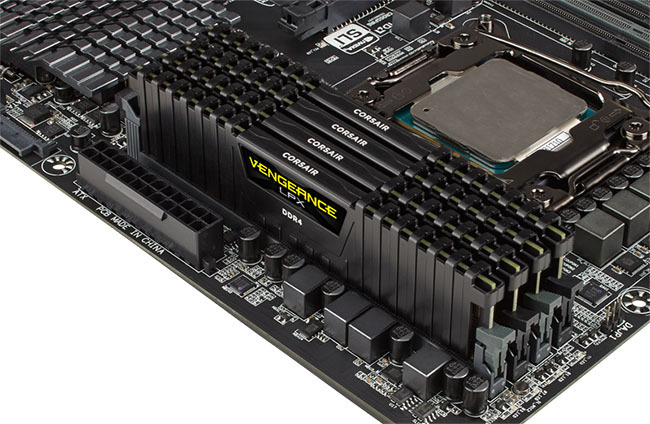 Vengeance LPX has been around for the better part of the year, since the launch of the X99 chipset. We're now routinely seeing manufacturers provide 3,000MHz kits without an absurd price premium over JEDEC-specified 2,133MHz memory. Scaling even higher, Corsair has a 3,400MHz offering in the same four-module configuration. Pricing, as you might expect, goes through the roof as you approach the cutting edge of what is currently available. Back on point, the low-profile Corsair modules look and feel like quality products. The livery and design hasn't changed since last year, and the aluminium heatspreader is provided in black, blue or red to suit a themed build. The company also includes an Airflow fan for enhanced cooling when overclocking farther than the 3,200MHz XMP 2.0 settings. And Corsair does a reasonable job of marrying speed to latency because the four-stick pack ships with XMP 2.0 timings that install the modules at 16-18-18-36-2T latencies using 1.35V. If for whatever reason the motherboard doesn't take kindly to XMP settings, the modules default to a JEDEC 2,133MHz and 15-15-15-36 timings at 1.2V. The real question is whether a 50 per cent uptick in potential bandwidth - DDR4-3,200 vs. DDR4-2,133 - is worth the extra expense, particularly on a top-end chip laden with a decent amount of cache. Corsair's four-module 16GB set costs approximately £140 compared to £100 for a limited-volume 2,133MHz pack of two 8GB modules. Booting up is as easy as setting the XMP 2.0 profile in the Asus motherboard's BIOS and rebooting into Windows. The extra overclocking knobs and whistles on the Skylake processor and Z170 chipset makes it easy to compare different speeds of memory without affecting the core chip frequency.